Do you use notepad to save your short notes only? Yeah I know it's a great tool for that. But there is much more it can do for you. Maybe you have learned about notepad tricks based on batch programming. This is the place from where every computer geek starts his journey ( and even I am one of them ). So what make notepad this much loving? Well first of all, it's not a tool for writing purpose only. It can be used to create variety of programs including cpp, HTML, batch, exe, java etc., and support wide range of programming languages. In today's tutorial I will guide you to make use of its one of the supported language - Batch. Batch programming is very popular ( mostly among newbies ) as it is easy to code and include simple English language based commands. I prefer to use latest notepad plus plus as it is more advanced. Before I start, first learn how to save notepad batch programs. Open Notepad from search menu. Now go to "File">"Save as" or press "Ctrl+S" from keyboard. Choose the location where you want to save file. Make sure that you have typed ".bat" after name as it is file type of batch programming and without it program will not be executed. 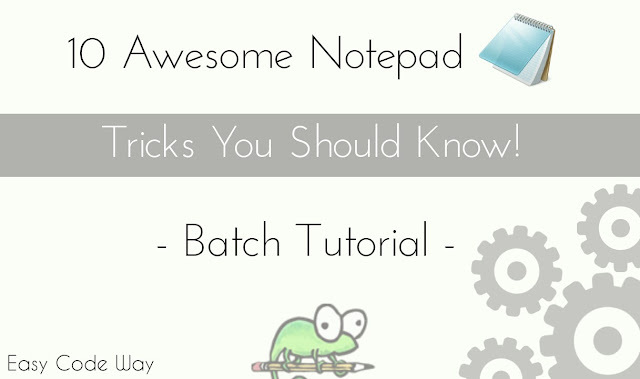 Here goes list of 10 super amazing notepad batch program based tricks that you had never tried before in your life and surely you gonna love them all. ECHO Welcome to infinite loop creator with any word or phrase. Maybe you have seen simple matrix falling effect. This time I had advanced it with color effect. I am using light green color text on black background. Save this code as "matrix.bat" and enjoy this tricks. Heading itself speaks. Here we will create a new folder which can neither be deleted nor can be renamed. Sounds good ? Hm. This program is based on 2 important commands - cd and md, where cd is used to mount command line on particular location ( Here it refers to the location where you want to create folder ). On the other hand, md is used to create new directory. Save below code as "folder.bat" and enjoy. Most probably, you would be thinking about on how to delete that folder than? Simply replace "md" with "rd" command from below code and repeat same steps. That's it. echo Your folder is being processed ! echo Do to want to check it. Press any button to open! echo press any key to continue. shutdown /s /t %time% /c "%msg%"
echo Time has been scheduled. Enjoy. Sometimes your computer may hang after a long use. This is because of increase in number of programs & cached data which results into heavy load on RAM. Using this concept I had create a very simple program that has power to hang your computer. I am using start command ( used to open programs ) under infinite loop so that it can continuously do that. Try below code and save it as "hang.bat". As you'll open the program, it will ask you for permission to continue. After which it will continuously open notepad, command prompt, C Drive, D Drive, E Drive, G Drive and finally you have to shutdown your computer with power button to stop that. First time I used this trick to prank my friend and he really got shocked after seeing this. echo Are you sure you want to hang you computer? Deleting files is the simplest thing everyone can do and we usually opt normal way to do that. But do you know, you can also use notepad for that. Copy paste below code inside notepad editor and save it as "delete.bat". echo your file from %I% has been successfully deleted. This trick also work in same way as #6th works and can hang your computer. As I had already mentioned, md commands is used to create new directory. Here I am advancing it to create Unlimited Folders using random operator. You just need to save below code as "folder.bat" and see its magic. I recommend you to save this program in new folder ( Desktop location is best ) as it will flooded thousands of folder which will be hard for you delete one by one. echo Are you sure to continue ? Now if you want to unhide them, simply replace "attrib +s +h" with "attrib -s -h" from below code and repeat same steps as above. So these are best top 10 cool notepad tricks you should try right now. I bet that these are new for you. what did you think about this? Last but not least if you have any problem or want to suggest something, please ask me in below comment box. Let's take this stage to next level. Start Conversation now.